See in Glossary can be emitted, and the direction of the start velocity. The Shape property defines the shape of the emission volume, and the rest of the module properties vary depending on the Shape you choose. See in Glossary emits particles in directions that are normal to the surface. The section below details the properties for each Shape. Note: Sphere and Hemisphere have the same properties. Shape The shape of the emission volume. Sphere Uniform particle emission in all directions. Hemisphere Uniform particle emission in all directions on one side of a plane. Radius The radius of the circular aspect of the shape. Radius Thickness The proportion of the volume that emits particles. A value of 0 emits particles from the outer surface of the shape. A value of 1 emits particles from the entire volume. Values in between will use a proportion of the volume. See in Glossary A texture to use for tinting and discarding particles. Clip Channel A channel from the texture to use for discarding particles. See in Glossary color falls below this threshold. Color affects Particles Multiply particle colors by the texture color. Alpha affects Particles Multiply particle alphas by the texture alpha. Bilinear Filtering When reading the texture, combine 4 neighboring samples for smoother changes in particle color, regardless of the texture dimensions. Position Apply an offset to the emitter shape used for spawning particles. Rotation Rotate the emitter shape used for spawning particles. Scale Change the size of the emitter shape used for spawning particles. See in Glossary. If the orientation is not satisfactory, you can also override it by applying a Start Rotation value in the Main module. Randomize Direction Blend particle directions towards a random direction. When set to 0, this setting has no effect. When set to 1, the particle direction is completely random. Spherize Direction Blend particle directions towards a spherical direction, where they travel outwards from the center of their Transform. When set to 0, this setting has no effect. When set to 1, the particle direction points outwards from the center (behaving identically to when the Shape is set to Sphere). 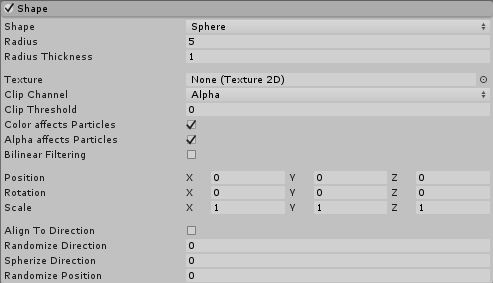 Randomize Position Move particles by a random amount, up to the specified value. When this is set to 0, this setting has no effect. Any other value will apply some randomness to the spawning positions of the particles. Cone Emit particles from the base or body of a cone. The particles diverge in proportion to their distance from the cone’s center line. Angle The angle of the cone at its point. An angle of 0 produces a cylinder while an angle of 90 gives a flat disc. Radius Thickness The proportion of the volume that emits particles.A value of 0 emits particles from the outer surface of the shape. A value of 1 emits particles from the entire volume. Values in between will use a proportion of the volume. Arc The angular portion of a full circle that forms the emitter’s shape. Mode Define how Unity generates particles around the arc of the shape. When set to Random, Unity generates particles randomly around the arc. If using Loop, Unity generates particles sequentially around the arc of the shape, and loops back to the start at the end of each cycle. Ping-Pong is the same as Loop, except each consecutive loop happens in the opposite direction to the last. Finally, Burst Spread mode distributes particle generation evenly around the shape. This can give you an even spread of particles, compared to the default randomized behavior, where particles may clump together unevenly. Burst Spread is best used with burst emissions. Spread The discrete intervals around the arc where particles may be generated. For example, a value of 0 allows particles to spawn anywhere around the arc, and a value of 0.1 only spawns particles at 10% intervals around the shape. Length The length of the cone. This only applies when the Emit from: property is set to Volume. Emit from: The part of the cone to emit particles from: Base or Volume. Texture A texture to be used for tinting and discarding particles. Clip Channel A channel from the texture to be used for discarding particles. Clip Threshold When mapping particles to positions on the texture, discard any whose pixel color falls below this threshold. Align to Direction Orient particles based on their initial direction of travel. This can be useful if you want to simulate, for example, chunks of car paint flying off a car’s bodywork during a collision. If the orientation is not satisfactory, you can also override it by applying a Start Rotation value in the Main module. Box Emit particles from the edge, surface, or body of a box shape. The particles move in the emitter object’s forward (Z) direction. Emit from: Select the part of the box to emit from: Edge, Shell, or Volume. Mesh, MeshRenderer and SkinnedMeshRenderer have the same properties. SkinnedMeshRenderer Emits particles from a reference to a GameObject’s Skinned Mesh Renderer. Type Where particles are emitted from. Select Vertex for the particles to emit from the vertices, Edge for the particles to emit from the edges, or Triangle for the particles to emit from the triangles. This is set to Vertex by default. 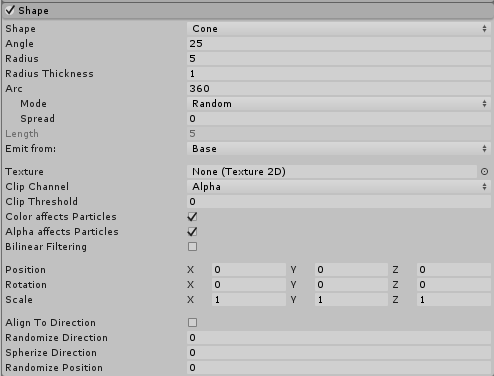 Mode How the position on the mesh is chosen for each new particle. 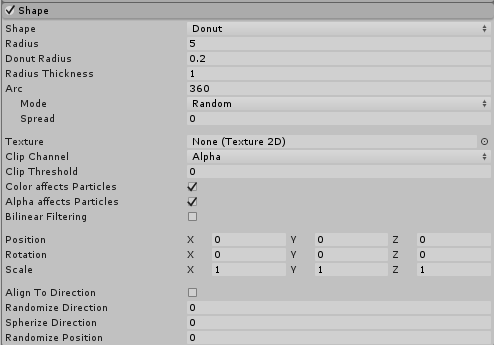 Select Random for the particles to choose a random position Loop for each new particle to be emitted from the next vertex in the mesh, or Ping-Pong to behave similarly to Loop mode, but to alternate the direction along the mesh vertices after each cycle. This is set to Random by default. Mesh The Mesh that provides the emitter’s shape. 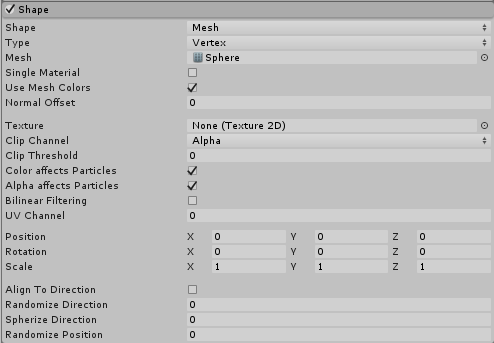 Single Material Specify whether to emit particles from a particular sub-Mesh (identified by the material index number). If enabled, a numeric field appears, which allows you to specify the material index number. See in Glossary color property “Color“ or ”TintColor” from the material. UV Channel Choose which UV channel on the source mesh to use for sampling the texture. You can choose to only emit particles from a particular material (sub-Mesh) by checking the Single Material property and you can offset the emission position along the Mesh’s normals by checking the Normal Offset property. To ignore the color of the Mesh, check the Use Mesh Colors property. 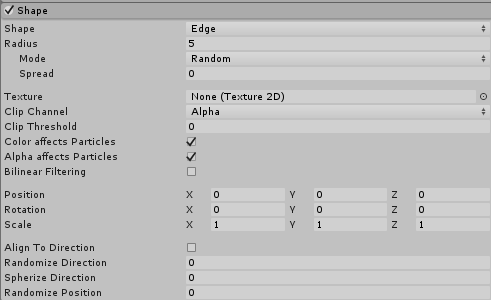 To read the texture colors from a mesh, assign the Texture you wish to read to the Texture property. See in Glossary. 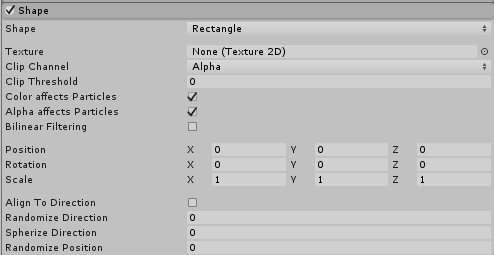 If you assign them in the Editor, Unity handles this for you. 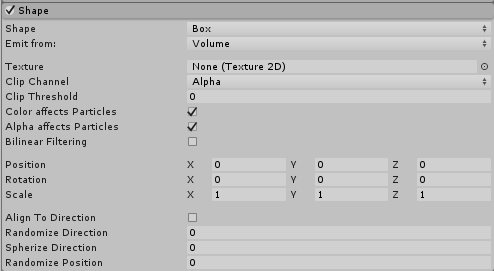 But if you want to assign different meshes at run time, you need to check the Read/Write Enabled setting in the Import Settings. The Mode property allows the Particle System to emit particles in a predictable order on the surface of a Mesh. When emitting from Vertices, this property allows you to emit each new particle from the next vertex in the array of vertices in the Mesh. When emitting from Edges, the Particle System can emit particles smoothly along the edges of the Mesh’s triangles/lines. Sprite and SpriteRenderer have the same properties. 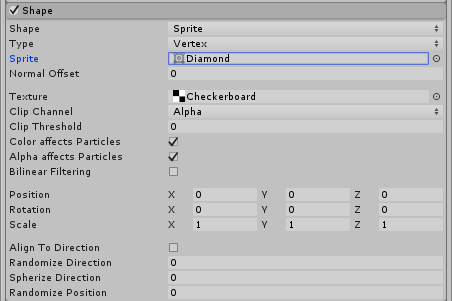 See in Glossary Emits particles from a Sprite shape supplied via the Inspector. Type Where particles are emitted from. Select Vertex to emit particles from the vertices, Edge to emit particles from the edges, or Triangle to emit particles from the triangles. This is set to Vertex by default. Sprite The Sprite that defines the particle emitter’s shape. Circle Uniform particle emission from the center or edge of a circle. The particles move only in the plane of the circle. Radius Thickness The proportion of the volume that emits particles. A value of 0 emits particles from the outer edge of the circle. A value of 1 emits particles from the entire area. Values in between will use a proportion of the area. Mode Define how Unity generates particles around the arc of the shape. When set to Random, Unity generates particles randomly around the arc. If using Loop, Unity generates particles sequentially around the arc of the shape, and loops back to the start at the end of each cycle. Ping-Pong is the same as Loop, except each consecutive loop happens in the opposite direction to the last. Finally, Burst Spread mode distributes particle generation evenly around the shape. This can be used to give you an even spread of particles, compared to the default randomized behavior, where particles may clump together unevenly. Burst Spread is best used with burst emissions. Spread Control the discrete intervals around the arc where particles may be generated. For example, a value of 0 will allow particles to spawn anywhere around the arc, and a value of 0.1 will only spawn particles at 10% intervals around the shape. Speed Set a value for the speed the emission position moves around the arc. Using the small black drop-down next to the value field, set this to Constant for the value to always remain the same, or Curve for the value to change over time. Texture Choose a texture to be used for tinting and discarding particles. Clip Channel Select a channel from the texture to be used for discarding particles. Bilinear Filtering When reading the texture, combine 4 neighboring samples, for smoother changes in particle color, regardless of the texture dimensions. Align to Direction Use this checkbox to orient particles based on their initial direction of travel. This can be useful if you want to simulate, for example, chunks of car paint flying off a car’s bodywork during a collision. If the orientation is not satisfactory, you can also override it by applying a Start Rotation value in the Main module. Edge Emit particles from a line segment. The particles move in the emitter object’s upward (Y) direction. Radius The radius property is used to define the length of the edge. Mode Define how Unity generates particles along the radius of the shape. 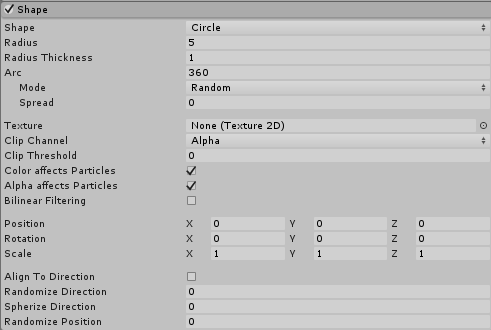 When set to Random, Unity generates particles randomly along the radius. If using Loop, Unity generates particles sequentially along the radius of the shape, and loops back to the start at the end of each cycle. Ping-Pong is the same as Loop, except each consecutive loop happens in the opposite direction to the last. Finally, Burst Spread mode distributes particle generation evenly along the radius. This can be used to give you an even spread of particles, compared to the default randomized behavior, where particles may clump together unevenly. Burst Spread is best used with burst emissions. Spread T the discrete intervals along the radius where particles may be generated. For example, a value of 0 will allow particles to spawn anywhere along the radius, and a value of 0.1 will only spawn particles at 10% intervals along the radius. Speed The speed the emission position moves along the radius. Using the small black drop-down next to the value field, set this to Constant for the value to always remain the same, or Curve for the value to change over time. Donut Emit particles from a torus. The particles move outwards from the ring of the Torus. Radius The radius of the main donut ring. Donus Radius The thickness of the outer donut ring. Spread The discrete intervals around the arc where particles may be generated. For example, a value of 0 will allow particles to spawn anywhere around the arc, and a value of 0.1 will only spawn particles at 10% intervals around the shape. Speed The speed the emission position moves around the arc. Using the small black drop-down next to the value field, set this to Constant for the value to always remain the same, or Curve for the value to change over time. Rectangle Emits particles from a rectangle. The particles move up from the rectangle.